The Motcombe Circuit has had a succession of faithful Stewards, but probably none have held the office longer than the present Chancellor. He was appointed junior Steward in 1902, and a year later became senior Steward. He was away from the Circuit for two years, but upon returning was at once elected to his former position. Upon the division of the Circuit three years ago he became sole Steward of the parent station. Mr. Fish enjoyed but few advantages of any kind in his early days, but he had no sooner experienced the great change, than he abandoned all his former habits and associates, and set himself to work in preparation for Christian work. For many years he has been an acceptable local preacher, and having prospered in temporal things through the blessing of God, he has freely given his service and means to the general extension of Christ’s kingdom. 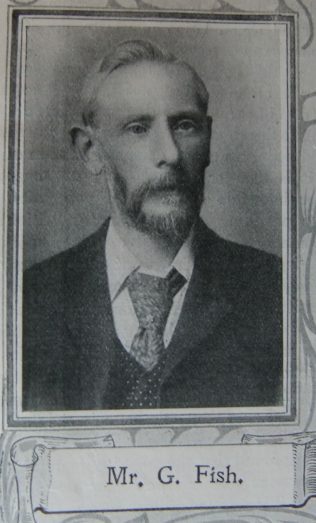 George was born in 1850 at Blanford, Dorset, to parents John and Maria. John was a sawyer. George was working as a brick moulder at the time of the 1871 census. At the time of the 1881 census, George was a draper’s assistant. In 1891 and 1901 he is listed as a draper and by 1911 he had retired. George married Elizabeth Jane Kingsbury (abt1849-1904) in late 1873 in the Shaftsbury Registration District, Dorset. Census returns identify seven children. George married Ellen Davis (b abt1869) in the summer of 1905 in the Shaftsbury Registration District, Dorset. George died on 10 January 1933 at Gillingham, Dorset.